What causes rare rainbow arcs? We analyze in this work some analogies between thermal emission of nano objects and Hawking’s radiation. We first focus on the famous expression of the black hole radiating temperature derived by Hawking in 1974 and consider the case of thermal emission of a small aperture made into a cavity (Ideal Blackbody). We show that an expression very similar to Hawking’s temperature determines a temperature below which an aperture in a cavity cannot be considered as standard blackbody radiating like T^4. Hawking’s radiation therefore appear as a radiation at a typical wavelength which is of the size of the horizon radius. 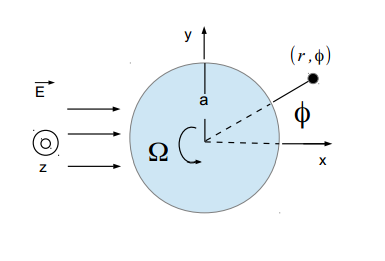 In a second part, we make the analogy between the emission of particle-anti particle pairs near the black hole horizon and the scattering and coupling of thermally populated evanescent waves by a nano objects. We show here again that a temperature similar to the Hawking temperature determines the regimes where the scattering occur or where it is negligible. Top view of a person standing in an elevator while facing the door. (a) Rays originating from a point (O) on an object, reflected from a plane surface, form a virtual image at the apparent point of origin (I) of the reflected rays. (b) Rays originating from a point on an object, reflected from many irregularly oriented small facets, cannot be traced back to an apparent common point of origin, so no image forms. (c) If many points (O1, O2, O3, etc.) along the object are approximately the same color and shape, then the randomly reflected rays from these various points can appear to have a common origin (I) and form an image. Isaac Newton just got cheated. 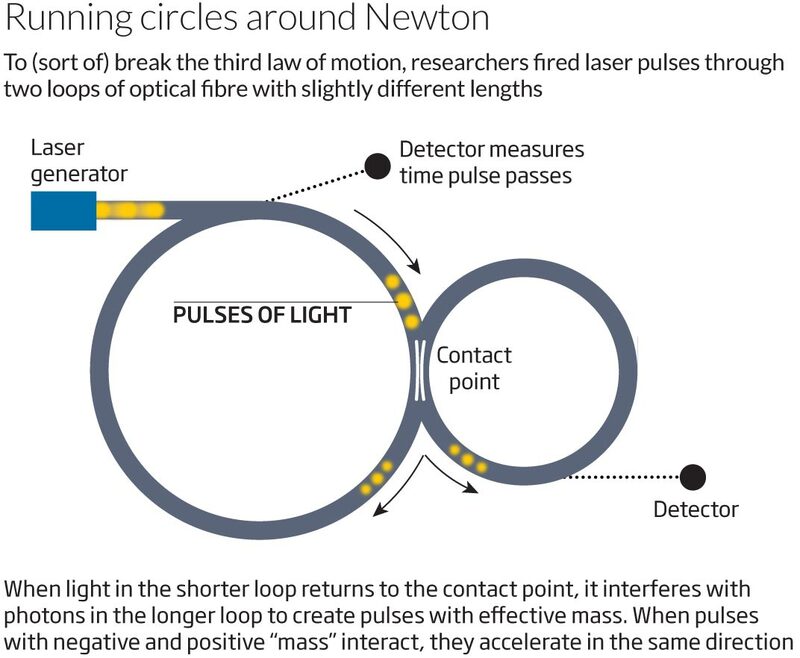 Laser pulses have been made to accelerate themselves around loops of optical fibre, seeming to break the physicist’s law that every action must have an equal and opposite reaction. The work exploits a trick with light that only makes it appear to have mass, so it is a bit of a cheat, but it may one day lead to faster electronics and more reliable communications. According to Newton’s third law of motion, when one billiard ball strikes another, the two balls should bounce away from each other. But if one of the billiard balls had a negative mass, then when the two balls collide they will accelerate in the same direction. This effect could be useful in a diametric drive, a speculative “engine” in which negative and positive mass interact to accelerate forever. NASA explored using the effect in the 1990s in a bid to make a diametric drive for better spacecraft propulsion. But there was a very big fly in the ointment: quantum mechanics states that matter cannot have a negative mass. Even antimatter, made of particles with the opposite charge and spin to their normal matter counterparts, has positive mass. Now Ulf Peschel at the University of Erlangen-Nuremberg in Germany and his colleagues have made a diametric drive using “effective mass”. As photons travel at the speed of light they have no rest mass. But if you shine pulses of light into some layered materials, such as crystals, some of the photons can be reflected backwards by one layer and then reflected forwards again by another. That delays part of the pulse, causing it to interfere with the rest of the pulse as it propagates more slowly through the material. “It’s a bit like what happens with a stroboscope,” says Dragomir Neshev at the Australian National University in Canberra, who was not involved in the study. If you watch a spoked wheel turning under a strobe it can appear to move at a different speed or even backwards. When a material slows the speed of the pulse proportional to its energy, it is behaving as if it has mass – called effective mass. Depending on the shape of the light waves and the structure of the crystal, light pulses can have a negative effective mass. But to get such a pulse to interact with one with a positive effective mass requires a crystal that is so long it would absorb the light before the two pulses could show a diametric drive effect. To get around this, Peschel created a series of laser pulses in two loops of fibre-optic cable. The pulses get split between the loops at a contact point, and the light keeps moving around each loop in the same direction. The key is that one loop is slightly longer than the other, so light going around the longer loop is relatively delayed (see diagram, above right). When that pulse comes back around and splits at the contact point, it shares some of its photons with pulses in the other loop. After a few round trips, the pulses develop an interference pattern that gives them effective mass. The team created pulses with positive and negative effective mass. When the opposing pulses interacted in the loops, they accelerated in the same direction, moving past the detectors a little bit sooner on each round trip. Electrons in semiconductors can also have effective mass, so the loops could be used to speed them up and boost processing power in computers, says Peschel. And in some fibres the speed of a light pulse is equivalent to its wavelength, which means the loops could be used to control a fibre’s colour output. Neshev says the method could increase the bandwidth of optical communications or even help create bright displays like laser screens. But he cautions that it will not be easy to adapt the loops for practical purposes. By Bernoulli’s law, an increase in the relative speed of a fluid around a body is accompanies by a decrease in the pressure. Therefore, a rotating body in a fluid stream experiences a force perpendicular to the motion of the fluid because of the unequal relative speed of the fluid across its surface. It is well known that light has a constant speed irrespective of the relative motion. Does a rotating body immersed in a stream of photons experience a Bernoulli-like force? We show that, indeed, a rotating dielectric cylinder experiences such a lateral force from an electromagnetic wave. In fact, the sign of the lateral force is the same as that of the fluid-mechanical analogue as long as the electric susceptibility is positive (ε>ε0), but for negative-susceptibility materials (e.g. metals) we show that the lateral force is in the opposite direction. Because these results are derived from a classical electromagnetic scattering problem, Mie-resonance enhancements that occur in other scattering phenomena also enhance the lateral force.